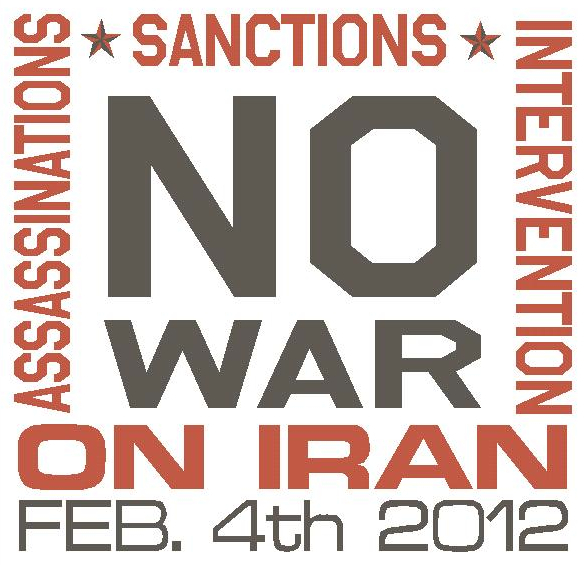 Join Chicago World Can't Wait and Others on Saturday Feb 4th to Say No War On Iran! As the U.S. steps up it’s threats against Iran we of World Can’t Wait along with many other groups are stepping up our commitment to the people of the world to stop the crimes of our government. Saturday February 4th is a national day of protest against a U.S. attack on Iran. The response has been dramatic: In barely more than a week, 50 actions have been announced around the country. In Chicago, we’re gathering at noon this Saturday at Federal Plaza – to say NO war on Iran, no sanctions, no intervention, and no assassinations. Hands off Syria! One thoughtful reader shared his concerns with us: “I think it would be well to remind each other that the Iran war won’t be like any others most have become acquainted with. It will likely be nuclear as our Secy of State Clinton practically chortled about the $5B we have recently been spending to ‘refurbish’ our nuclear arsenal. These weapons have already been delivered to Israel.” The effects would be devastating, to the people of Iran and far beyond. One more reason why we must ACT. * Join a Facebook event and invite friends, all of them! * Join us in Federal Plaza on February 4! NO war! NO sanctions! NO intervention! NO assassinations! Hands off Syria!